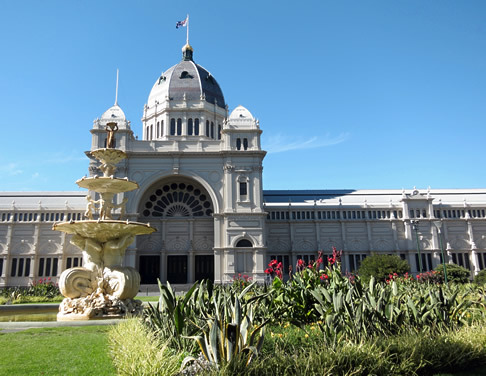 Melbourne’s status as Australia’s cultural and sporting capital is reflected by two imposing sights in the city—the Melbourne Cricket Ground (MCG) and the Shrine of Remembrance—both backed up by an amazing array of national, state and metropolitan galleries, performance venues and sports stadia. The extensive tram system is just as impressive, and gives you an insight as to how other cities may have looked had they not been so eager to turn their streets over to the motor vehicle. Melbourne is host to a number of different architectural styles, many of them quite daring, especially recent additions like Federation Square and Eureka Tower. However, unlike Wellington, there is a general cohesiveness. In fact this even extends to the city council’s new identity. Having witnessed the city first hand, I can’t see it as anything other than a perfect graphic manifestation of Melbourne’s built environment. Before I really started to explore the city, I met up with friend and former colleague Phil McCluskey. Nervous that I may miss him as well as Kyle, I was glad to spend an afternoon with him, getting a guided tour of the Fitzroy and Carlton suburbs whilst we hunted for dinner. Not only was it great to see Phil, but it was nice to be able to talk to somebody familiar after three weeks of talking to complete strangers! Given Australia’s passion for sport, it’s perhaps no surprise that the MCG—whilst outside the CBD—still forms an integral part of the city. Its six large light towers dominate the landscape around Melbourne’s ‘Sports and Entertainment Precinct’, a huge section of parkland littered with sporting venues of every size and description. As a city that hosted the Olympic Games of 1956, I was keen to see how many of the buildings from this time remained. Unfortunately much has changed, although the Olympic Park is still home to the Olympic Pool—the first fully indoor Olympic swimming venue. This is now an indoor training centre and office complex, and sadly the only major structure from the games to look much as it did in 1956. Many of the other buildings have since been replaced by motorways and car parks. The same is true of the MCG. Whilst one part of the huge oval is still named in honour of the Olympics, the oldest part of the complex is actually the light towers that were erected in 1985. The rest of the was stadium completely rebuilt in sections between 1992 and 2005. Part of this refurbishment included the creation of the National Sports Museum, which includes a special section devoted entirely to the Olympics. The cauldron from the 1956 Olympic Games. As you can imagine, this got my full attention. I was immersed in all its collected memorabilia—everything from a laurel wreath presented to a winning athlete at the inaugural 1896 games, to a ticket stub from the most recent games in Beijing. One of the most interesting displays was the (almost) complete collection of Olympic relay torches from 1936 to 2008. 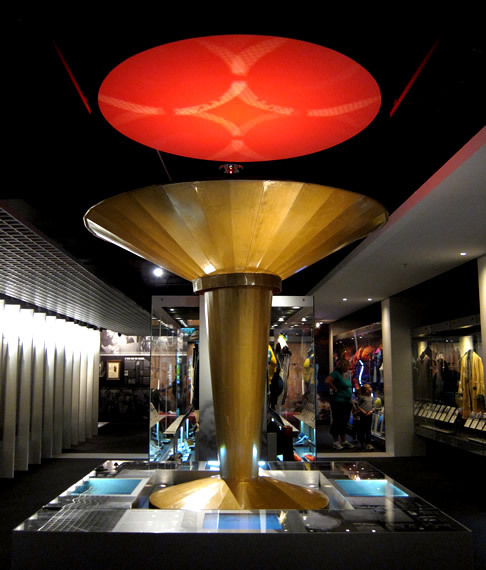 The centrepiece of this display was the original Olympic cauldron from the Melbourne games—although its flimsy, thin metal construction had me believe it was a replica until I read the supporting text. Keeping with this theme of sporting geekery, I was also keen to check out Albert Park, host to the Australian Grand Prix every March. Although it was obvious to make out from maps situated around the park, it took me some time to realise that main road that circles the lake was indeed the race track. 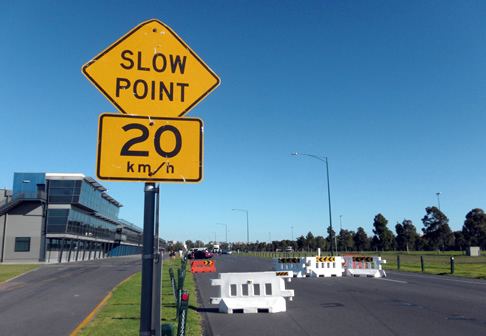 The pit lane on the Albert Park grand prix circuit. So much of the supporting track furniture is removed from the site when the circuit is not in use. Even the pit lane complex could be mistaken for offices, were it not for the road layout and the row of garage doors along its frontage. Of course I couldn’t pass by without standing on the very same podium that Jenson Button had stood only 10 months beforehand—although when I looked out across the start/finish straight all I could see was a makeshift car park. Pack Light: This time I left my laptop at home, and took a small point and shoot camera (the Canon S90) rather than an SLR and assorted lens. Leaving the laptop behind was entirely the right thing to do, so I doubt it’ll be joining me on any future trips. Taking a point and shoot was also a great call. The best camera is the one you have with you, and being so small meant I had no hesitation taking it with me everywhere I went. Still, I’d like to take my SLR on future trips, especially as it forces you to study buildings and landmarks a little closer as you try to hunt down the perfect composition. I also decided to take a rucksack rather than a suitcase this time around, and this worked out really well too. I think it really depends on the itinerary and the type of trip as to which type of luggage is best suited, but it was certainly the right choice for this particular adventure. I still could have packed less. Sleep Cheap: I was slightly anxious about staying in hostels, and whilst it was sometimes annoying to share a room with complete strangers, it did result in me getting up early (when sleeping in a single room the temptation to sleep until 11am was often too great). I can’t think how much money I saved either—an absolute bargain seeing as most where of equal quality to many hotels. Roam Prepaid: Given the silly amount I spent whilst roaming across Europe, I really didn’t want to the same in Australasia, where data is doubly expensive. I purchased a ‘Data Abroad’ bolt-on for £50, and this drastically reduced my mobile phone bill. I would have used less than the 50MB pre-paid allowance had I not downloaded an entire Wikipedia article on the history of the Australian National Flag! Overall, whilst this trip was really inspiring, and a great start to this new decade, I feel as though I didn’t make the most of the opportunity. Given that I went all the way to New Zealand, not have seen some of the most popular sites (especially those on the South Island) only serves to annoy me. The same is true for the experience I had watching the fireworks display in Sydney. Had I planned properly, I may have gone to a ticketed event that could guarantee comfort and a view. The lesson to be learnt here is to focus on the preparation next time around.